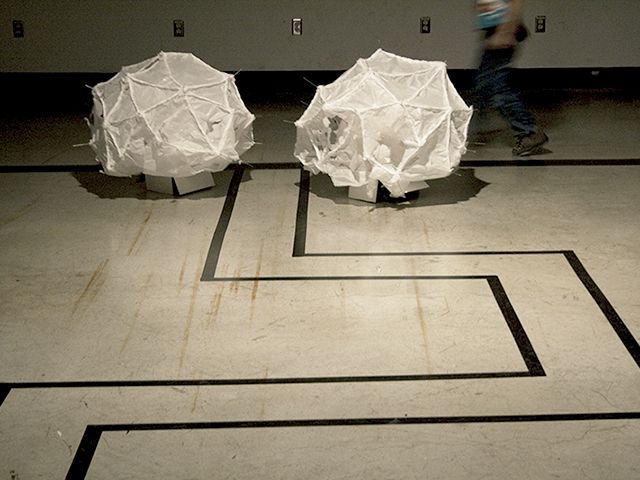 The piece consists of two robots made of tissue paper, papier-mache and bike spokes. They inhabit the same space, divided in two parts, and they move around very slowly. In this interactive piece, two exact objects try to complete a circular motion. Only one can complete the circle on behalf of the other’s failure. When the participant triggers the sensor, one object hits the other in order to accomplish its purpose. The other sees every attempt blocked. The participant is responsible of making the objects move. 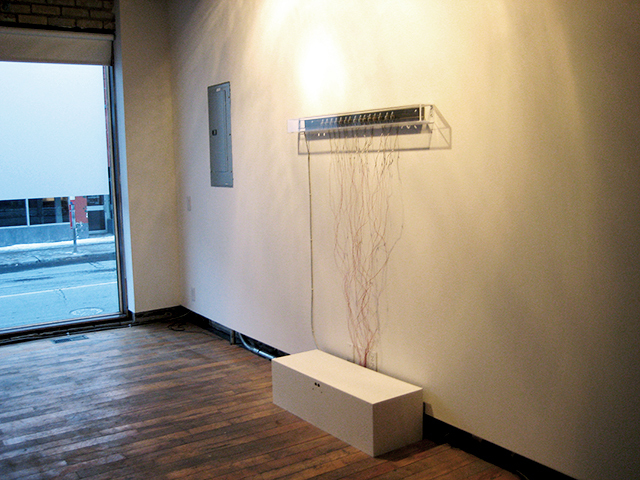 Therefore, its interaction with the piece generates violence. In this interactive piece, two exact objects try to complete a circular motion. Only one can complete the circle on behalf of the other’s failure. A conversation is an interactive piece. 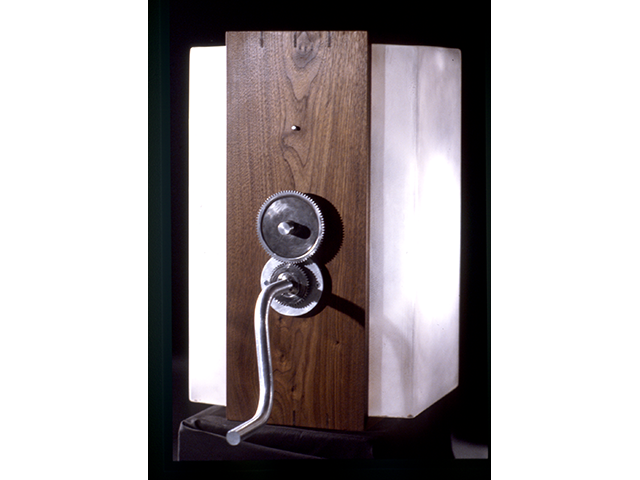 There are 10 solenoids producing sounds and creating a composition between images and sounds. Each solenoid is coupled to a light. When the solenoid turns on, it makes visible the image attached to it. But, when the viewer/participant gets next to the piece, the experienced scenery breaks down. Its dimensions are very small so invites for closeness. However, the participant attempt of being part of this private world always fails. A conversation is an interactive piece. Its dimensions are very small so invites for closeness. However, the participant attempt of being part of this private world always fails. 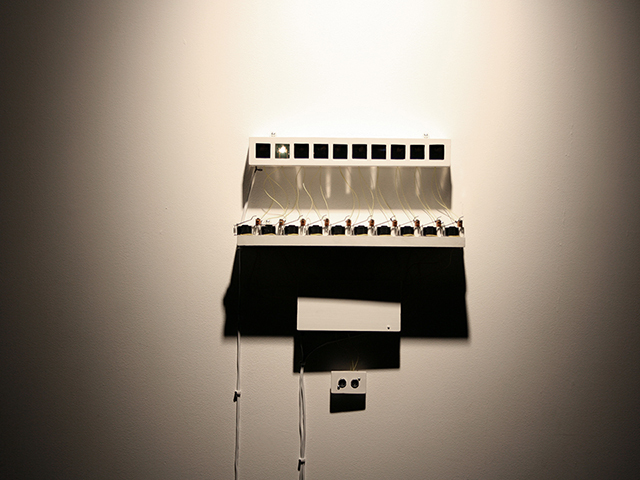 This sound piece consists of 15 solenoids that repeat a pattern in a loop. They move in groups and interact with the others building a conversation. As we move around the room, we hear two layers of sounds. One is the sound of the solenoids themselves and the other one is the digitized sound of the solenoids. The second one is easily recognized as modifiable. As we walk around the room, new sounds are digitally generated. There is the possibility that we realize that our movements are generating a change. This change gives us the illusion that we can transform things around us. We are responsible for the alterations in our surroundings. The question is if those changes can alter the pattern to be constantly creating new ones. This sound piece consists of 15 solenoids that repeat a pattern in a loop. They move in groups and interact with the others building a conversation. There is the possibility that we realize that our movements are generating a change. There are two objects moving on a circular track. They move independently from each other in a codependent manner and they live within rules created for a group of two. These rules have been programmed into the vehicles so they can interfere, hit, follow and escape each other. Whenever they hit, each one has 8 choices – forward with 4 different speeds and backward with 4 different speeds. The result of their interactions cannot be predicted. 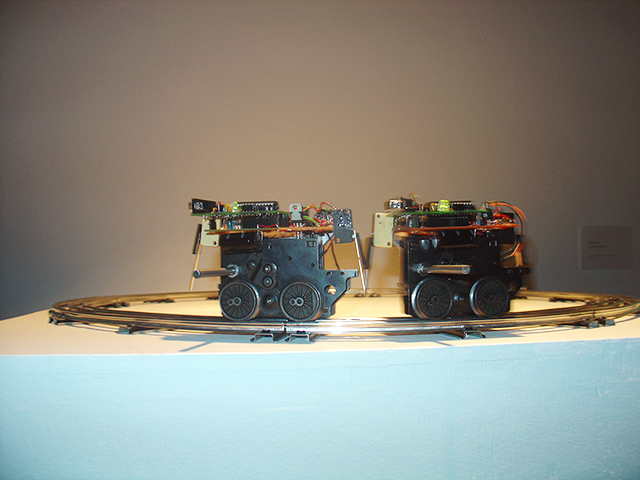 With model trains, we create a contained, miniature world that is controllable. However, in this piece, I have hacked the trains and they no longer function as originally intended. We cannot control them; their behaviour goes beyond our control. They generate unpredictable behaviours and, consequently, an unpredictable system where a new and different kind of order can emerge. There are two objects moving on a circular track. They move independently from each other in a codependent manner and they live within rules created for a group of two. 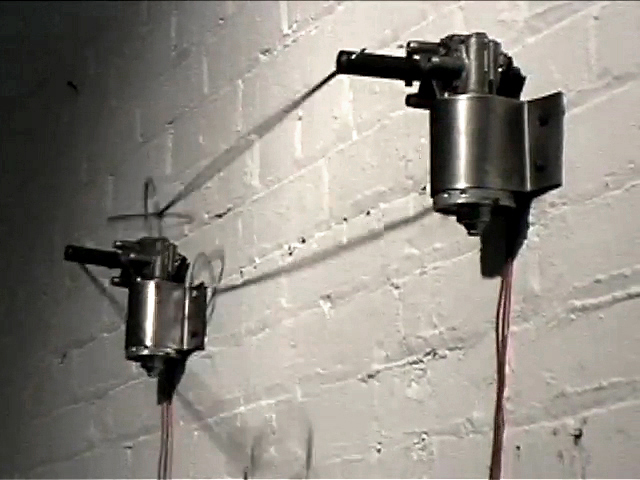 Skipping is a mechanical machine based on the mutoscopes.